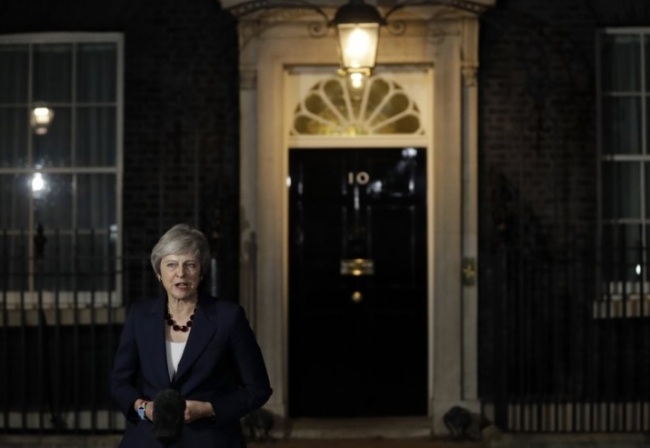 LONDON (AP) — In a hard-won victory, British Prime Minister Theresa May persuaded her fractious Cabinet to back a draft divorce agreement with the European Union on Thursday, a decision that triggers the final steps on the long and rocky road to Brexit. But she faces a backlash from her many political opponents and a fierce battle to get the deal through Parliament as she tries to orchestrate the UK’s orderly exit from the EU. May hailed the Cabinet decision as a “decisive step” toward finalizing the exit deal with the EU within days. It sets in motion an elaborate diplomatic choreography of statements and meetings. EU chief negotiator Michel Barnier declared there had been “decisive progress” — the key phrase signaling EU leaders can convene a summit to approve the deal, probably later his month. But the agreement, hammered out between UK and EU negotiators after 17 months of what Barnier called “very intensive” talks, infuriated pro-Brexit lawmakers in May’s Conservative Party, who said it would leave Britain a vassal state, bound to EU rules that it has no say in making. Those “hard Brexit” voices include several ministers in May’s Cabinet. Emerging from the five-hour meeting at 10 Downing St., May said the Cabinet talks had been “long, detailed and impassioned.” She said there had been a “collective decision” to back the deal, though she did not say whether it was unanimous. “I firmly believe, with my head and my heart, that this is a decision which is in the best interests of the United Kingdom,” she said. If the EU backs the deal, as it likely will, it must be approved by Britain’s Parliament. That could be a challenge, since pro-Brexit and pro-EU legislators alike are threatening to oppose it. On the other side of the argument, pro-EU legislators say May’s deal is worse than the status quo and the British public should get a new vote on whether to leave or to stay. Failure to secure Cabinet backing would have left May’s leadership in doubt and the Brexit process in chaos, with exit day just over four months away, on March 29. She still faces the threat of a coup attempt from her own party. The main obstacle to a withdrawal agreement has long been how to ensure there are no customs posts or other checks along the border between the UK’s Northern Ireland and EU member Ireland after Brexit. Britain and the EU agree that there must be no barriers that could disrupt businesses and residents on either side of the border and undermine Northern Ireland’s hard-won peace process. The solution in the agreement involves a “single EU-UK customs territory,” to eliminate the need for border checks. As part of the agreement, the UK will agree to follow EU rules in areas like animal welfare, environmental standards and workplace protections — another source of anger for Brexiteers, who say Britain should be free to set its own rules. The solution is intended to be temporary — superseded by a permanent trade deal. But pro-Brexit politicians in Britain fear it may become permanent, hampering Britain’s ability to strike new trade deals around the world. The draft agreement also mentions potential “Northern Ireland-specific regulatory alignment” to avoid a hard border. Northern Ireland’s Democratic Unionist Party, which props up May’s minority government, insists it will oppose any deal that leaves Northern Ireland subject to different rules to the rest of the UK after Brexit. “We could not as unionists support a deal that broke up the United Kingdom,” DUP leader Arlene Foster said.